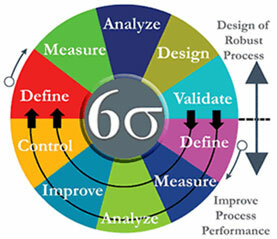 Many people ask, what is Six Sigma, and why it's so popular? It is a business management strategy that provides quality management methods, which go from business and cost-benefit analysis, thought-process mapping customer surveys, to control charts and regression analysis. It has one major difference from other business management models, Six Sigma puts on measurements as the starting point of culture change and decision making processes. Yellow Belts have basic knowledge of Lean Six Sigma, and usually carry out performance improvements within their teams. Green Belts are certified and trained at a more advanced level of Lean Six Sigma. They tackle change within their business in addition to their other responsibilities. Black Belts are trained at an even more advanced level and are fluent in the use of the Lean Six Sigma approach and tools. They deliver major performance or efficiency transformations for a business. They usually are Change Leaders for a business. Champions are those that sponsor performance improvement projects. They are usually managers of processes and business areas that are trained to pinpoint where transformations / improvements are needed to and help remove barriers to the implementation of changes. This method has had great success and is one of the most used by all types of organizations. The demand of Six Sigma Green Belt and Black Belt certifications has increased dramatically at Firebrand Training especially with the combination of the Green Belt and Black Belt, which will get you both the certifications in just 10 days. George Eckes gives an effective explanation and introduction of what Six Sigma is through the video below. Three blind men touch different parts of the elephant and draw very different conclusions. One touches the tusk and says it’s a spear; the other touches his torso and says it’s a wall, and the third blind man touches the tail and says it’s a snake. The point of the story is that depending on your perspective and viewpoint, it can mean very different things. Six Sigma is a metric, it’s an improvement methodology, it’s a management philosophy and it creates a common language throughout the whole organisation.